Endodontic Treatment ( Root Canal ) problems ? Root canal therapy is a procedure that is performed to essentially "save" a tooth with infected or deceased pulp. Our Guelph dentist generally refers patients to a trusted endodontist in cases where their tooth can be treated with a root canal procedure. In a lot of cases, it is smarter to have a root canal performed by a specialist with years of training in the field of endodontics to ensure a successful outcome. Root canal treatment may be required as a result of a number of potential causes. Severe decay, injury/trauma or even repeated dental procedures on a tooth may all cause the tooth's root to become infected or die off. When a patient experiences this problem, he or she has two options: to extract the tooth, or "save" it with an endodontic (root canal) procedure if possible. During a typical endodontic procedure, the patient will first receive a local anesthetic to numb the area. 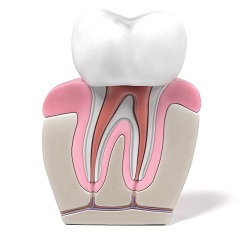 Next, the dentist or endodontist will create an opening in the tooth in order to access the root or nerve. Then, the infected/dead pulp is removed and the root canal(s) are cleaned to ensure that infection won't recur. The treated tooth is then sealed with a cap or dental crown to protect it from future damage and provide an aesthetic result, or in some cases, sealed off with a composite resin material. The success rate of root canal treatments is extremely high, with many treatments lasting a lifetime. A root canal-treated tooth should be looked after and cleaned daily just like a regular tooth. For more information about root canal therapy, contact our Guelph dentist Dr. Coman today.